Confidence within the Scottish construction industry has reached a new record high of PLUS 29, up three points on the rating recorded at the end of 2014. This is the headline result of the most recentScottish Construction Monitor, a quarterly survey of the membership of the Scottish Building Federation. The independent construction trade body has issued its latest report just days before the entry into force of new regulations which will impose significant new health and safety responsibilities on domestic building projects. The 2015 Construction (Design and Management) regulations (CDM 2015) are due to enter into force on Monday, 6th April and will replace existing regulations that came into force in 2007. In particular, the new regulations will impose certain minimum requirements concerning health and safety management for domestic projects. The positive rating recorded by the Q1 2015 Construction Monitor means that industry confidence has now been rated positive for seven consecutive quarters since the second quarter of 2013. In preparation for the introduction of the CDM 2015 regulations, the survey also asked industry employers a series of questions designed to assess their levels of awareness and preparedness for the new regime and what impact they think it might have on their business. 94 per cent of respondents were either fully or partially aware of the new regulations and two thirds said they felt either fully or somewhat prepared for their entry into force. The overwhelming majority of respondents also have previous experience of drafting or contributing to construction phase plans and of providing site inductions and on-site welfare facilities for their workers. These are some of the main new responsibilities that contractors will have to assume on behalf of domestic clients under the new regulations. Almost two thirds of respondents said they thought the new regulations would create additional costs while almost one third thought they would make health and safety compliance more complicated. Overall, 60% thought the impact on their business would be minor while a further 11% thought the impact would be significant and almost one quarter remained unsure what the impact would be. In anticipation of the CDM 2015 regulations, SBF has been hosting a series of road show events for building companies throughout Scotland to help them understand the implications of the new legislation and to prepare for its entry into force. 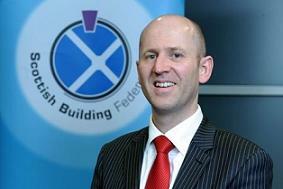 Commenting on the survey results, SBF Managing Director Vaughan Hart(pictured) said: “It’s good to see confidence within the Scottish construction industry up once again for the first three months of 2015. We continue to monitor the industry’s performance carefully since certain sectors of the industry still offer significant scope for improvement over the coming months. In order to be sustainable, it’s important that the industry’s recovery is suitably balanced across all sectors. “Ordinary consumers are probably largely unaware of the impending entry into force of the CDM 2015 regulations. But they will have important implications for the responsible management of health and safety on domestic projects. That being the case, it’s more important than ever that customers choose a reputable, properly qualified contractor to carry out building works on their home.